Imagine going on a treasure hunt. Where would you look for the treasure? How would you find it? Would there be a treasure box? What would be inside? Some treasure boxes contain beautiful jewelry and precious coins. But as members of The Church of Jesus Christ of Latter-day Saints, we have a treasure that is even more valuable: the gospel of Jesus Christ. Many people don’t know about this treasure, so one of our duties is to share it with as many people as we can. After Jesus and His Apostles died, some important gospel teachings and ordinances were lost or changed, including baptism, priesthood authority, temples, living prophets, and the sacrament. All of these gospel treasures were restored through the Prophet Joseph Smith. Heavenly Father and Jesus Christ appeared to Joseph Smith in the Sacred Grove when he prayed to know the truth. Later Joseph received the gold plates and translated them into the Book of Mormon. The Book of Mormon contains teachings that we treasure because it explains truths that were once lost. We receive many blessings because we have these gospel truths. What precious treasures these are! Share how the treasures of the gospel of Jesus Christ bless your family. 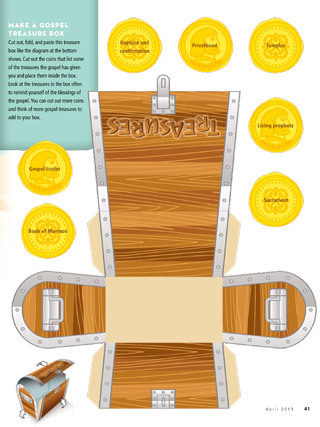 Cut out and fold this treasure box like the diagram at the bottom. Cut out the coins that list some of the treasures the gospel has given you and place them inside the box. Look at the treasures in the box often to remind yourself of the blessings of the gospel.